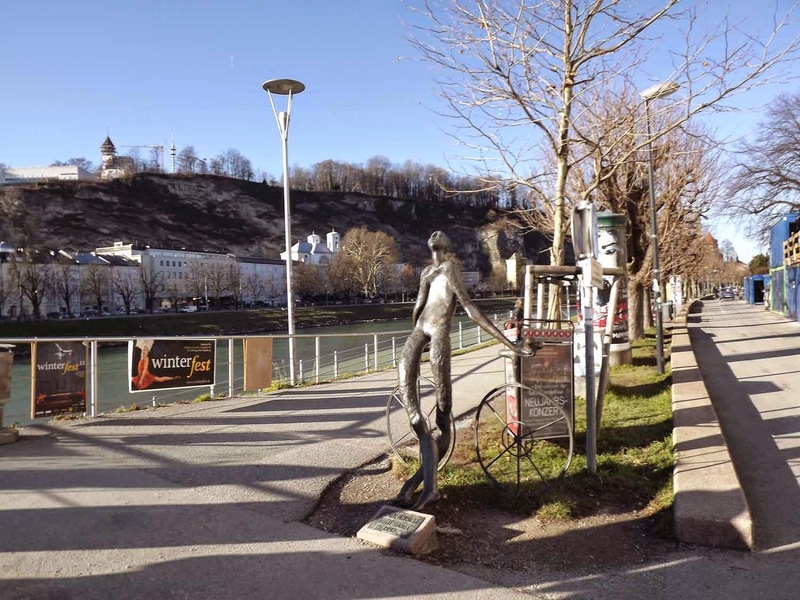 When I received my itinerary for my Viking River Cruise, this was the day I had highlighted. It was the day I was entering Austria, the birthplace of my maternal grandmother, for the first time. It was also where I would be able to see where the story of the Sound of Music actually took place. It’s always been one of my favorite films. My friend Tracy and I were up early and headed to the dining room for breakfast. She had an omelet and I chose the blueberry pancakes with some yogurt. We enjoyed talking with some other passengers before we headed outside for our 8:15 tour. It was a bit cold and very foggy when we got off the boat, but we were assured that it would pass as the day went on. 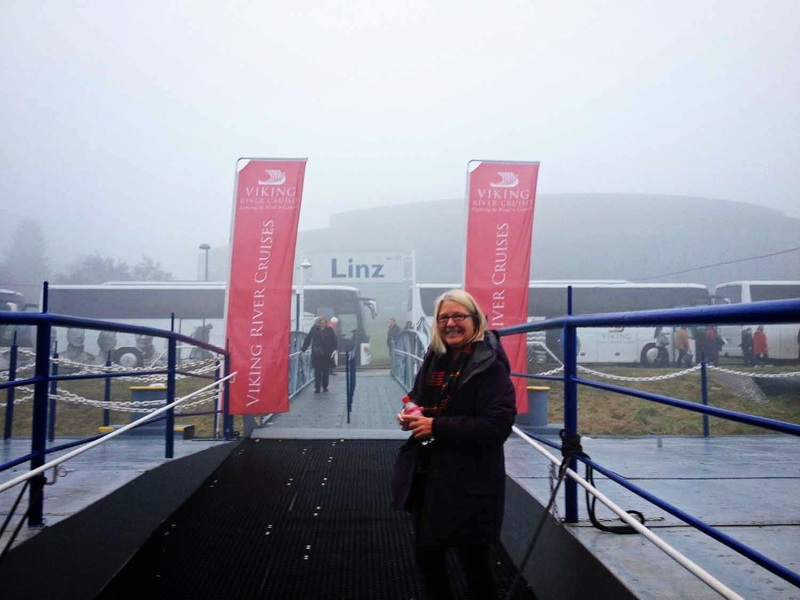 The Viking River Cruise buses were waiting for us outside the boat to take us through the city of Linz and into Salzburg. The guide told us about how Linz, Austria, the birthplace of Adolph Hitler, was very industrial and even though it had become cleaner, it was still always foggy. It was disheartening to hear that part of the city’s history included the fact that it was the first place to hold a concentration camp. 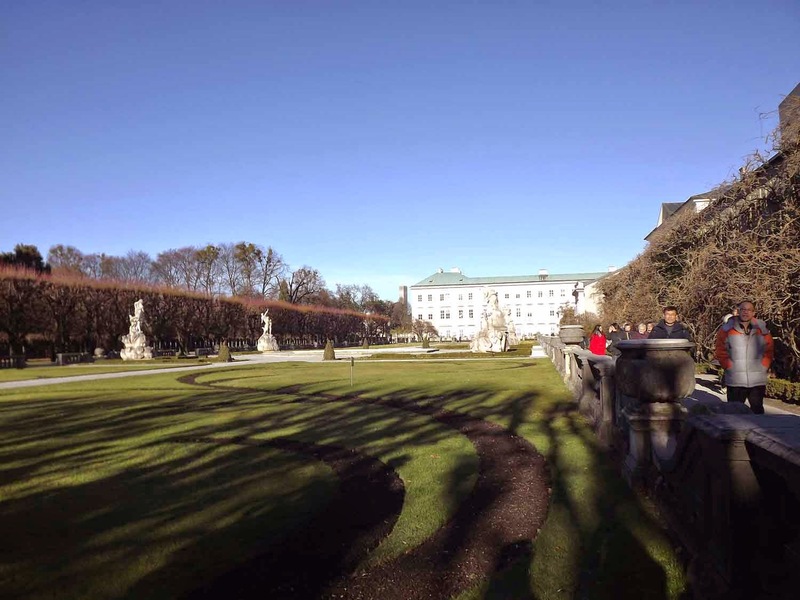 On the two hour trip to Salzburg, our guide also told us all about the Von Trapp family and how much (very little) we saw in the movie that was fiction. She also filled us in on the remaining family members, the most public of which own the Trapp Family Lodge in Stowe, Vermont. We stopped at a rest stop to use the bathrooms and were told to meet on the side of the building to see the lake. 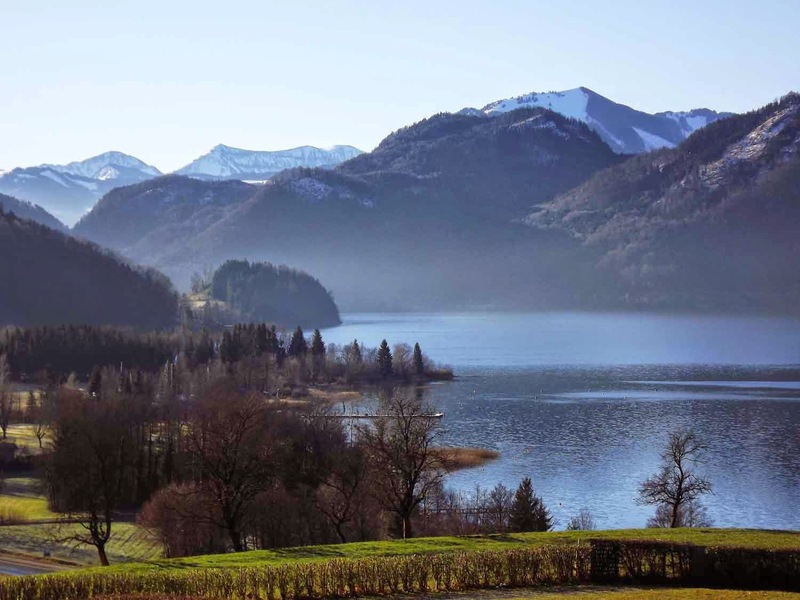 We were able to see the spectacular views of Mondsee Lake. Behind the lake were the Austrian Alps. The Alps were as beautiful as I remembered Julie Andrews strolling and singing through with the Von Trapp children. Over the front mountains were the actual ones in the film where “The hills are alive with the sound of music.” I know it probably sounds corny, but I relived that moment before getting on the bus and heading into Salzburg. 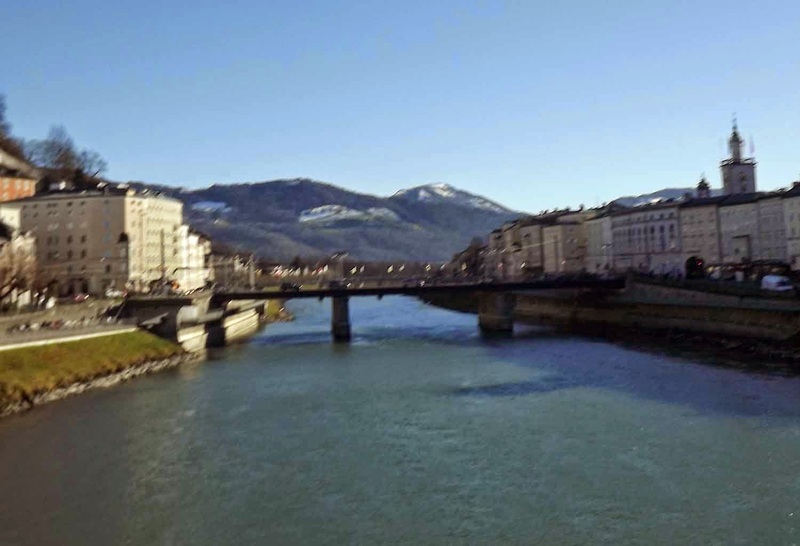 I was immediately taken with the town of Salzburg. It was picturesque with all that a European city should have, from cobblestone streets to cafes and bakeries. The first thing we did was a walking tour of the city with our guide. He quickly reminded us that .50 Euro was required to use public bathrooms and I found out this was very true. 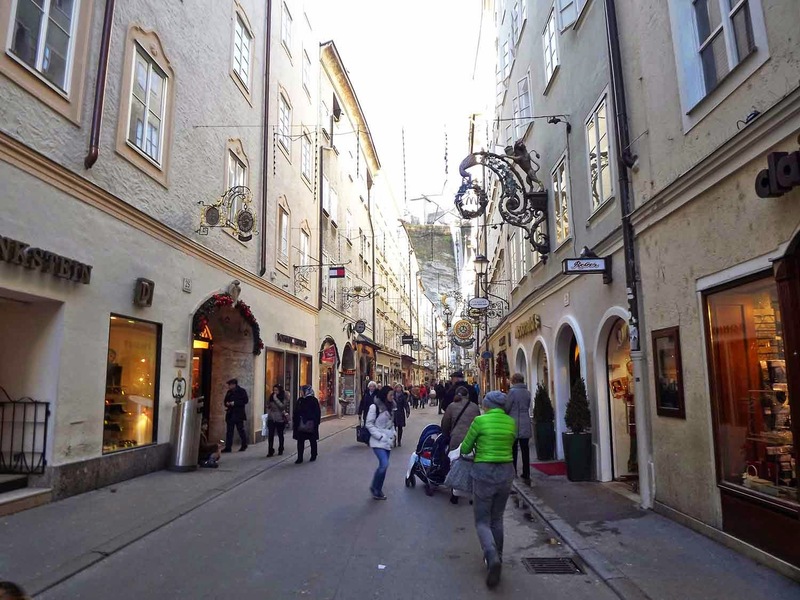 The Sound of Music is not the only thing that put Salzburg so clearly noted on the map. 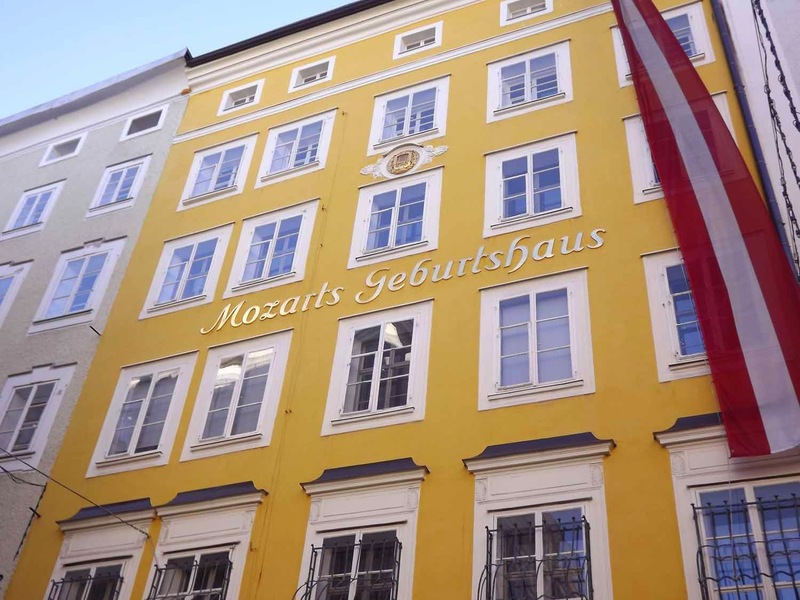 It is also the birthplace of Mozart and the place he was born and where he lived with his family are honored in the city. In the park we saw more indications of the contemporary Salzburg, through modern artwork and young people in fashionable garb. The shops and alleyways were all decorated for the holidays and I fought the urge to stop and examine each one. Everything in Salzburg seemed to carry its own touches. 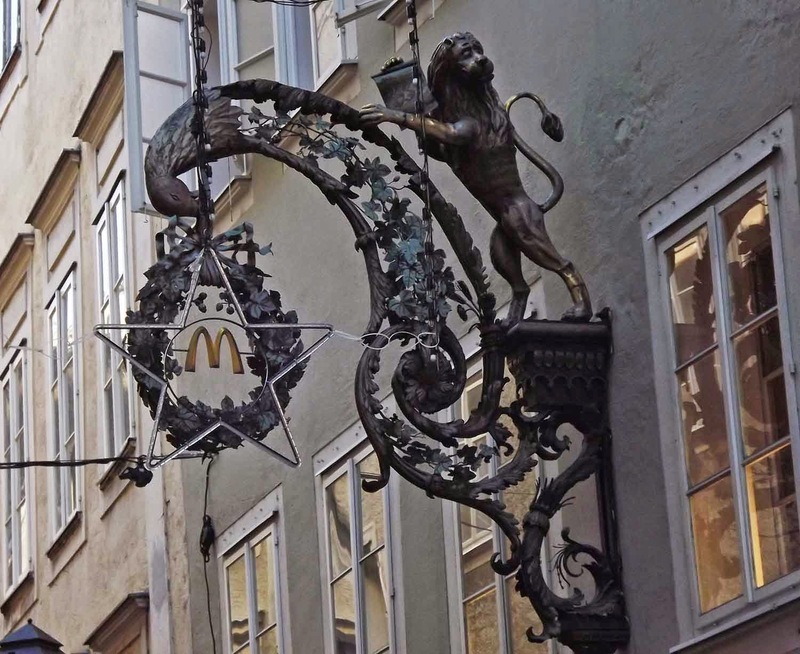 Even McDonald’s had a crest over its doorway. 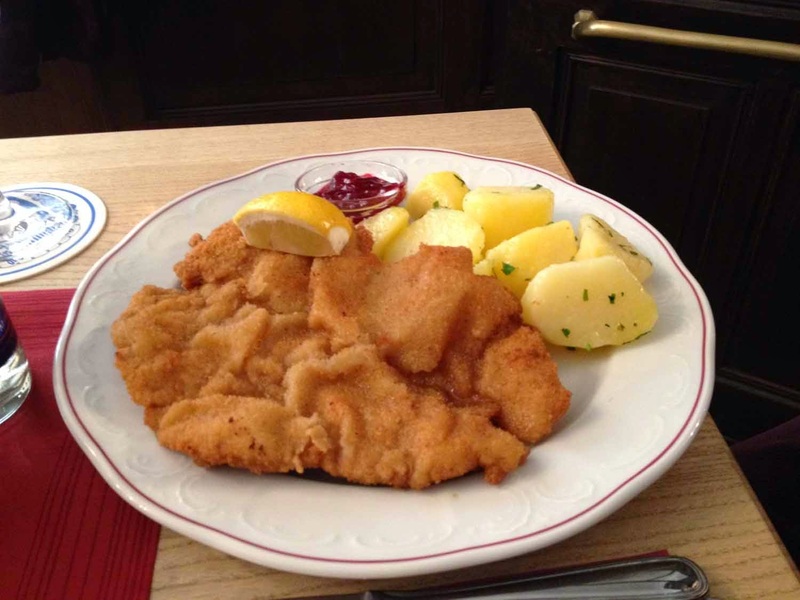 We had an Austrian lunch at Café Kugel with a fellow writer, Susan Kime. I had an excellent Beef Goulash with a potato ball while they both chose and enjoyed the Weiner Schnitzel. I also had some delicious Apple Strudel. Tracy and I stopped at the Christmas Market in front of the cathedral. It is the oldest market of its kind in the Alps. We saw lots of handmade items, including many embroidered tablecloths. There was also plenty of Mozart Chocolate, baked goods, and, of course, Glὕhwein. We had a short time to rest before dinner. We were so tired we decided not to even change. For dinner we had some wonderful Austrian wine. I chose the Grilled Chicken with Three Sauces. It was tender and the sauces were a nice touch. 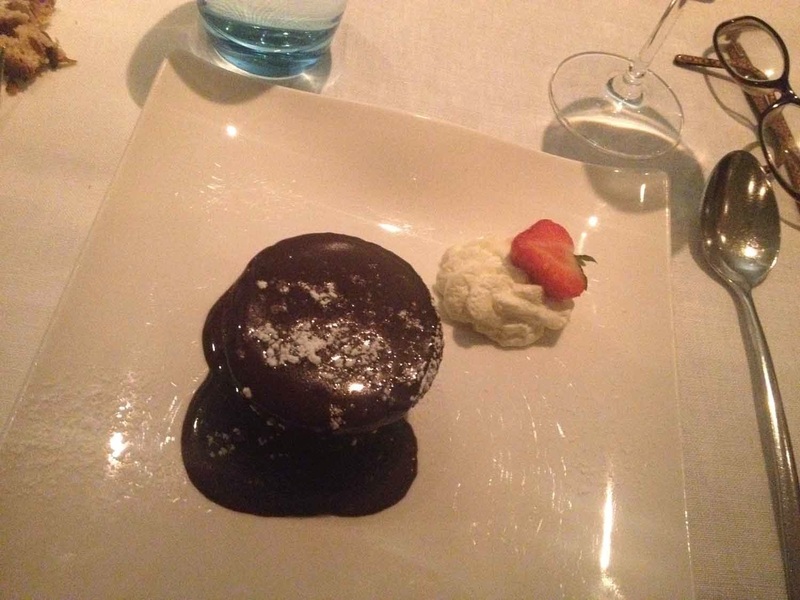 Dessert was a chocolate soufflé. 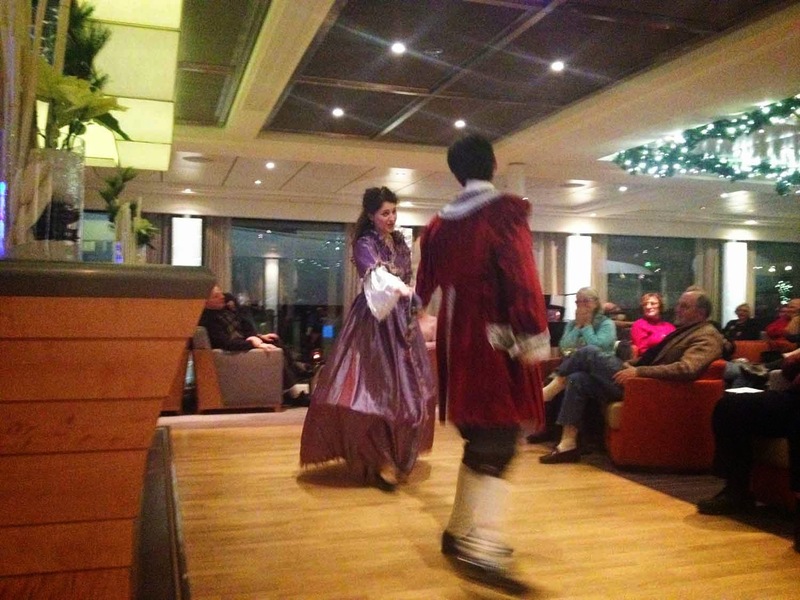 In the evening after dinner, we were treated to a “Sound of Music” show with singing and dancing. It was really well done and over by 10:00 pm. *Christmas in July? Yes! 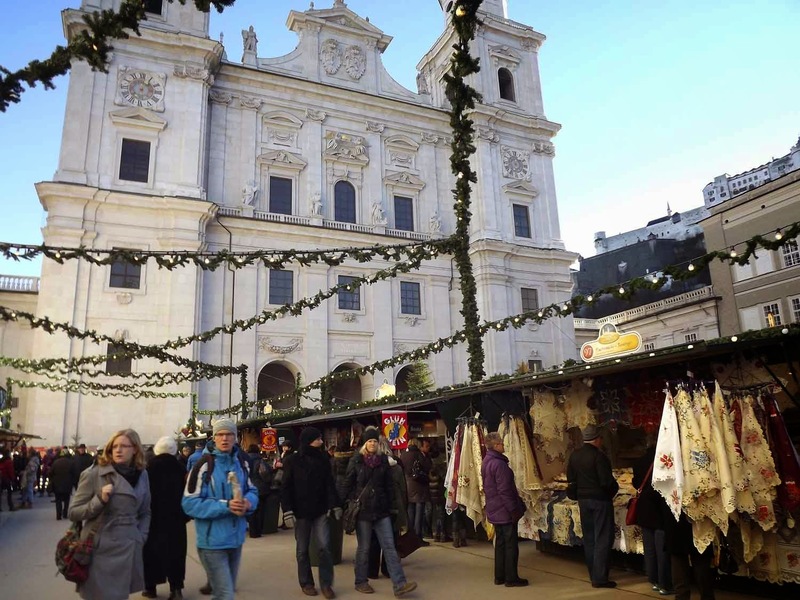 I was running a bit behind and I decided to just save my Viking River Christmas Market Cruise report until July. After all it’s a perfect time to start thinking about booking one of your own while the prices are low!